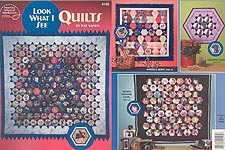 My thanks to Janet, and all of you who asked for Quilting Patterns-- Here you go! Quilting & Sewing, P. 1 * P. 2 * P. 3 * P. 4 * P. 5 * P. 6 * "Best-Loved Quilt Patterns"
Yo-Yo Quilting, House of White Birches, 2010. 27 fun designs for every occasion: Pumpkin Man and Cat, Pumpkin Pin, Wreaths, Santa and Elves, Ornaments (Snowman, Tree, Angel, and Candy Cane), Christmas Tree, Christmas Throw, Santa, Snowman Set (Placemat, Napkins, & Napkin Rings), Puppy, Tic- Tac- Toe Game, Star Flowers Candle Mat, Star Table Topper, Bedding trim, and throws and quilts. Brand NEW! Quilts for Kids to Love, designed by Kathy Wesley, American School of Needlework, 2004. 27 quilts using 10 easy- to- sew patterns. Brand NEW! 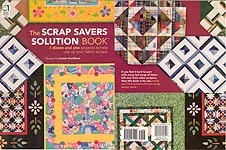 The Scrap Savers Solution Book, designed by Connie Kauffman, House of White Birches, 2007. A dozen and one projects to help use up your fabric scraps. Brand NEW! 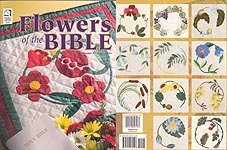 Flowers of the Bible, designed by Helen Curtis, House of White Birches, 2003. Designs include: Lentil, Mandrake, Balm, Rock Rose, Cattails, Coriander, Flax, Frankincense, Grapevine, Vine of Sodom, Henbane, Water Lily, Mallow, Cockle & Raven, Caper Bush, Tulip. Pomegranate, Saffron Crocus, Turk's Cap Lily, Narcissus, Crown Anemone, Common Poppy, Common Myrtle, Water Iris, Black Mustard, Crown of Thorns, Common Rue, Aloe, and Hyssop. Also information on Topography of the Holy Lands, and Colors in the Bible. Brand NEW! 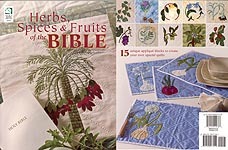 Herbs, Spices, & Fruits of the Bible, designed by Helen Curtis, House of White Birches, 2011. Designs include: Mandrake, Chicory, Onion, Garlic, Leek, Shallot, Cinnamon, Mint, Safron, Cumin, Mustard, Olives, Dates, Figs, and Grapes. Brand NEW 2011 Release! 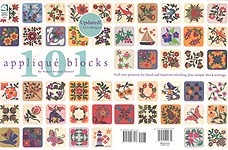 101 Applique Quilt Blocks (updated), designed by Nancy Brenan Daniel, House of White Birches, 2010. Updated with 7 new designs -- ful-size patterns for hand and machine stitching plus sample block settings. Brand NEW! 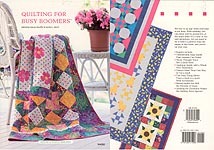 Quilting for Busy Boomers, edited by Jeanne Stauffer & Sandra L. Hatch, House of White Birches, 2008. 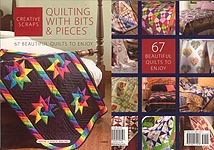 Chapters include: Unbelievably Easy Quilts that Anyone Can Make, Never Thought You'd See A Quilt Here, Applique Quilts Add A Whole New Dimension, There's More Than One Way to Cut A Quilt, The Only Thing Better Than a Quilt Is a Quilt With Accessories, Pieced Quilts Are Still the Favorite of Many, and Quilting For Christmas Makes the Holiday Extra Special. Brand NEW! Quilting With Bits & Pieces, House of White Birches, 2006. 67 beautiful quilts to enjoy. Brand NEW! 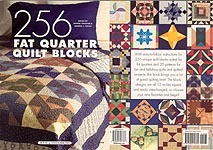 256 Fat Quarter Blocks, edited by Jeanne Stauffer & Sandra L. Hatch, House of White Birches, 2005. 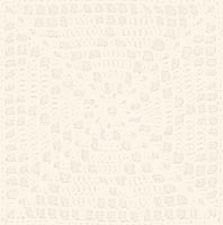 Easy- to- follow instructions for 256 unique quilt blocks and 20 patterns for quilts and quilted projects. Block designs are all 12 inches square. Brand NEW! Revised Patchwork Minus Mathwork, House of White Birches, 2009. 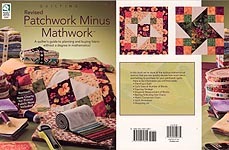 A quilter's guide to planing and buying fabric, with charts for quilt sizes & numbers of blocks, yardages needed, etc. Brand NEW! 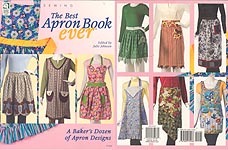 The Best Apron Book Ever, edited by Julie Johnson, House of White Birches, 2009. A baker's dozen of apron designs. Brand NEW! 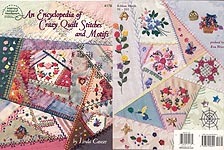 An Encyclopedia of Crazy Quilt Stitches and Motifs, designed by Linda Causee, American School of Needlework, 1997. 101 examples, from basic to complex, in embroidery and ribbon embroidery. Brand NEW! 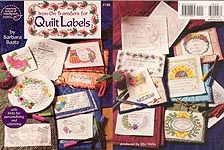 Iron-On Transfers for Quilt Labels, designed by Barbara Baatz, American School of Needlework, 1999. 47 pages of transfers, with hints for embroidery, personalization, and colorizing. Brand NEW! 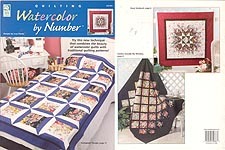 Quilting: Watercolor by Number, designed by Lucy Fazely, House of White Birches, 2002. New technique that combines the beauty of watercolor quilts with traditional quilting patterns. Brand NEW! Look What I See Quilts, designed by Pat Yamin, American School of Needlework, 2001. Over a dozen projects, many incorporating photographs. Brand NEW! 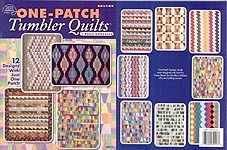 One-Patch Tumbler Quilts, designed by Rosie Gonzalez, American School of Needlework, 2003. 12 designs with just one patch. Brand NEW! 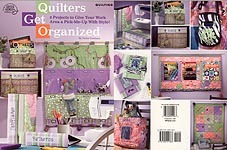 Quilters Get Organized, designed by Pattie Donham, American School of Needlework, 2006. 8 projects include: Quilted Binder Covers, Basket Liners, Scrapbook Covers, Memory Quilt, Inspiration Wall Organizer, Triptycy Frame, Tote Bag, and Cell Phone Dangle. Brand NEW! 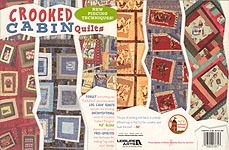 Crooked Cabin Quilts, designed by Pat Sloan, Leisure Arts, 2005. New piecing techniques for making "log cabin style" blocks. Brand NEW! 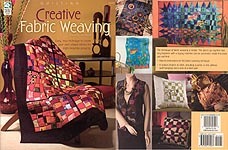 Creative Fabric Weaving, designed by Julie Higgins, House of White Birches, 2006. Easy new technique to create your own unique blocks for 8 projects, including small wall quilts, pillows, purse, vest, and full-size quilt. Brand NEW! Simple Shape Table Toppers, designed by Pat Campbell, House of White Birches, 2007. 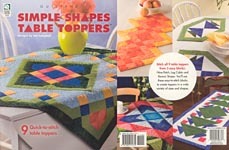 Nine quick-to-stitch designs using three blocks (Nine-Patch, Log Cabin, and Roman Stripes) in various combinations and colors to create toppers in a wide variety of sizes and shapes. Paper-pieced triangle units and rotary cutting save time. Brand NEW! 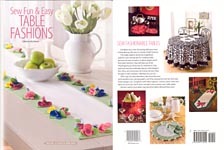 Sew Fun & Easy Table Fashions, edited by Julie Johnson, House of White Birches, 2008. 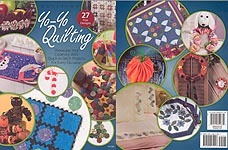 This 176-page hard-cover book contains inspiration, patterns, and sewing tips for creating table fashions for any occasion, using a variety of sewing techniques, includign quilting, applique, cut-out, ribbon weaving, etc. Projects include tablecloths, placemats, napkins, chair backs, runners, baskets, and more. Also included: a storage bag for table leaves, many recipes, and decorating ideas. Brand NEW! 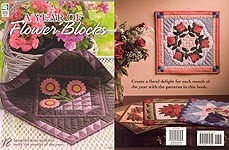 A Year of Flower Blocks, designed by Jodi G. Warner, House of White Birches, 2007. A 15" x 15" floral delight for each month of the year, using paper piecing, appliquè and traditional or quick piecing. Basic instructions for all techniques given. Brand NEW! Autumn Harvest Quilts, designed by Jodi G. Warner, House of White Birches, 2007. 8 projects to celebrate fall include: Scrappy Leaf Quilt, Oak & AcornPillow, Autumn Rows Wall Quilt, Autumn Tie-Ons, Indian Corn Topper, Scrappy Scarecrow, Autumn Irish Chain Throw, and Leave & Vine Runner. Brand NEW! 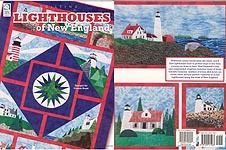 Lighthouses of New England, designed by Connie Rand, House of White Birches, 2006. 10 appliquèd lighthouses surround a Mariner's Compass. Also included: Eagle Island Wall Quilt. Brand NEW! Fun With Fabric Frames, designed by Joyce Mori & Pat Hill, House of White Birches, 2007. New Technique to show off quilt designs and create fancy borders. 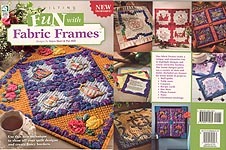 Includes frames in a variety of sizes and styles for: Wall quilts, table mats, coasters, recipe cards, hot mats, photo frames, totes, and Christmas stockings. Brand NEW! 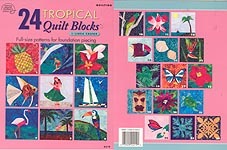 24 Tropical Quilt Blocks, by Linda Causee, American School of Needlework, 2004. Full -size patterns for foundation piecing. Brand NEW! 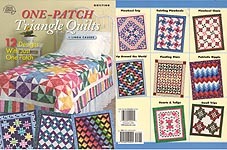 One-Patch Triangle Quilts, by Linda Causee, American School of Needlework, 2004. 12 designs with just one patch. Brand NEW! 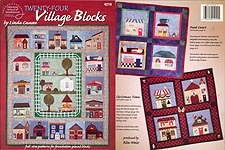 Twenty-Four Village Blocks, by Linda Causee, American School of Needlework, 2002. Full-sized patterns for foundation-pieced blocks; plus instructions for Village Square Quilt and two mini-quilts. Brand NEW! 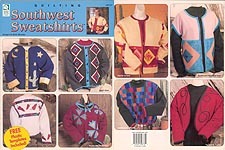 QUILTING: Southwest Swearshirts, designed by Beth Wheeler, House of White Birches, 2001. 8 designs plus plastic templates. Brand NEW! Quilts in a Hurry, designed by Rita Weiss, American School of Needlework, 1991. Patterns include: Star and Stripes, Blue Pinwheels, Ribbons and Ribbons, Another Trip Around the World, Blue Delft Sunshine and Shadows, Blue Pinwheels, If the Irish Were Amish, Nine Patch Jewels, Nine Patch Flower Garden, Southwest Trips, and Double Zig Zag. Brand NEW! 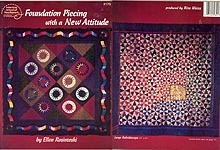 Foundation Piecing with a New Attitude, designed by Ellen Rosintoski, American School of Needlework, 1996. Patterns include: Lillehammer (flaps, mitered borders), Small Kaleidoscope (matching center points), Large Kaleidoscope (varying the block sizes), Mohawk Trail (curved reverse applique), Starburst Wallhanging (Reverse applique for circular blocks), Baby It's Cold Outside (diagonal sets and reverse applique), Paramecium Unleashed (positive/ negative color schemes and diagonal sets). Brand NEW! A Rainbow of Quilts, designed by Ellen Rosintoski, American School of Needlework, 12004. 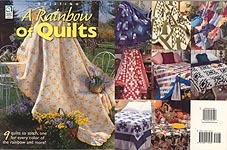 Patterns include: Strawberry Red Album, Old- Fashioned Sunshine, Thanksgiving, Tree of Life, Dream Catcher Delight, True Lover's Knot, Four- Patch Diamonds, Rainbow Illusions, Log Cabin Color Blocks. Brand NEW! 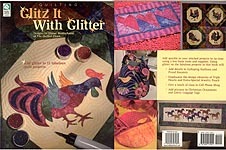 Glitz It With Glitter, designed by Elaine Waldschmitt, American School of Needlework, 1996. Projects include: Triple Hearts, four Proud Roosters, Galloping Stallions, Cell Phone Sling, Christmas Ornaments (Mitten, Ball, Tree), Glitzy Luggage Tags (Star, Cat, Tree), Extra- Special Jewelry Pouch. Brand NEW! 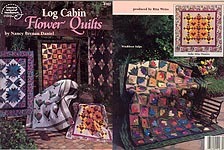 Log Cabin Flower Quilts, designed by Nancy Brenan Daniel, American School of Needlework, 1995. Patterns include: Tulip Garden, Primrose Path, Tulip Bed, Folk Tulip Bouquet, Windblown Tulips, Tulipsi nthe Dark, Floral Quartet, Make Mine Pansies, Flowering Garden, It's the Berries. Brand NEW! 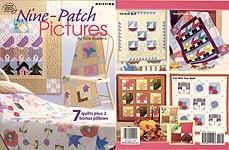 Nine- Patch Pictures, designed by Trice Boerens, American School of Needlework, 2004. 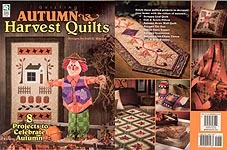 Patterns include: Autumn Leaves Quilt, Springtime Quilt, Sailboat Quilt, Favorite Things Quilt, Three Bears Quilt, Going Places Quilt, Cats With Toys Quilt, Corn & Pear Pillow, Peas & Tomato Pillow. Brand NEW! 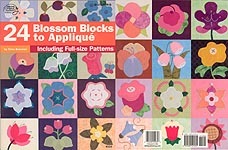 24 Blossom Blocks to Applique, designed by Trice Boerens, American School of Needlework, 2006. Full- size patterns include: Anemone, Purple Iris, Lily of the Valley, Wild Rose, Coreopsis, Starflower, Tulip, Tulip Trio, Sunflower, Pansy, Tulip Wreath, Shirley Poppy, Peacock Orchid, French Marigold, Campanula, Rosebud, Pink Bell, Red Beauty, Blue Lily, Pincushion Flower, Rose & BUtterfly, Rose of Sharon, Dahlia, and Ladylike. Brand NEW! 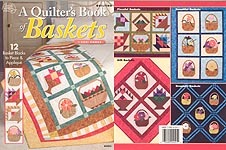 A Quilter's Book of Baskets, designed by Dori Hawks, American School of Needlework, 2004. Patterns include: Applique Patterns -- Basket, Crocus, Hibiscus, Daisy, Daffodil, Wild Rose, Calla Lily; Pieced Basket Blocks -- Dori's Basket, Floal Basket, Floral Cake Stand, Grape Basket, Nosegay Basket, Vase of Flowers; Quilts -- Gift Baskets Quilt, Bountiful Baskets Quilt, Sampler Baskets Quilt, Pieceful Baskets Quilt, Dramatic Baskets Quilt. Brand NEW!